This was originally created as one of the series of fundraising campaign collaterals for Richard Hugo House. Richard Hugo House is a non profit organization and is a center for the literary arts that supports writers of all ages and backgrounds and promotes the creation of new writing. 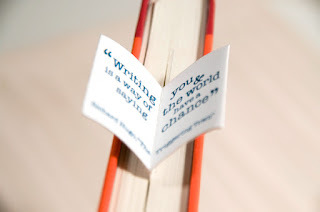 This bookmark is one of the pieces that I designed when I worked at Golden Lasso a couple of years ago. 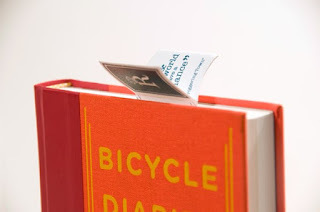 For the literature lovers, bookmarks are always the "must item" to carry on your book. But it is so easy to lose it by getting it sink between the pages. Then, I realized. What if it has the thing to stay above the book top, and what if that thing shaped like a book!? 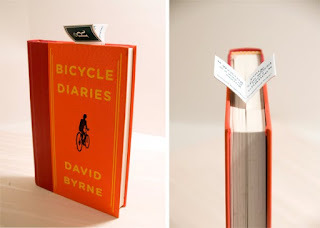 Yes, it's a book-shaped bookmark! Just like the logo for the Richard Hugo House, this book-shaped bookmark with a quote of Mr. Richard Hugo will always support you and encourage you as you read more books. Unfortunately, the grant we tried to get for them did not go through, so this project was ended un published but we do hope that someday we will make this happen. so fun and clever! beautifully done! i love it.